The lessons from Sweden’s success are debated once again. TC [Tom Coburn]: Go look at Sweden. Here’s what Sweden did. They cut their spending and their taxes. They have the best growth rate in Europe. They had a surplus this year. They had growth at six-plus percent. They actually did a Reagan style approach to their problem by cutting spending and cutting taxes. And they’re the fastest growing with a decline in their debt-to-GDP ratio. EK: But correct me if I’m wrong, but if I recall, Sweden’s monetary policy went towards a very sharp devaluation, they’ve been driven by export growth, and alongside Israel, they’ve been more aggressive than any other central bank in the world. They’ve done stuff that if we did it here, people would lose their minds. TC: I think there are monetary parts to that. But their finance minister put in place tough stuff. They had people who left Sweden because of the tax ratio. Now they’ve moved back. And it’s not a perfect example, but it’s an exception to the Krugman story. But Ezra didn’t challenge Coburn on the claim about spending cuts; why don’t we look at what Sweden has actually done, as opposed to the official right-wing line? Look, in particular, at actual government consumption — purchases of stuff. In terms of the facts, they are both right: Sweden did lower taxes and expenditure and did increase economic freedom a lot, especially from the late 1980s to the mid 1990s. Importantly, budget rules were reformed. As a result of these reforms, Sweden ran a large budget surplus and had low public debt when the financial crisis came in 2008. 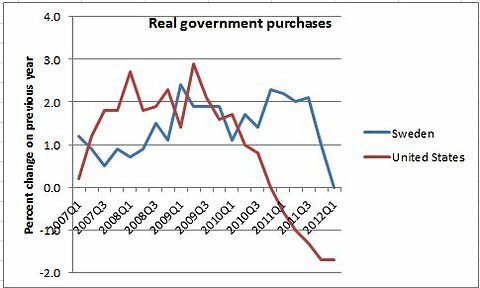 Because of this, Sweden could afford a more expansionary policy during the crisis (as indicated by the graph in Krugman’s post). Does the expansionary policy during the crisis also explain why Sweden did reasonably well? Maybe. It is hard to know. The important (and politically more tricky) part, however, was to implement the reforms before the crisis.